An Arts Bring Change Grant from Staten Island Arts, with public funding from the New York State Council on the Arts, has enabled Port Richmond High School Orchestra and Band students to explore the subject of microtonality with the American Festival of Microtonal Music (AFMM) under the direction of Johnny Reinhard, Director of the American Festival of Microtonal Music and Dr. Dan Auerbach, Assistant Professor of Music at the College of Staten Island/CUNY and a longtime member of AFMM. Understanding microtonality enables these Port Richmond student musicians to play more in tune. Dr. Auerbach commented: “I wanted to continue to enable these students, with whom I have a longstanding relationship, to learn how to improve their playing by introducing them to a specialized topic—microtonality. I am just glad I can collaborate with my colleague, the director of the AFMM, to show these students a different way of thinking about improving their playing.” Dr. Auerbach has been teaching at Port Richmond since 2017 as part of a recruiting initiative at CSI. Throughout each semester, he works with the Orchestra to prepare them for their school concert. Dr. Auerbach and AFMM are excited to return to PRHS following an initial successful run in 2018. AFMM was founded by Johnny Reinhard to showcase past and contemporary microtonal music and to introduce microtonality to the listening public. Through his direction of the AFMM and his other individual efforts, Reinhard has almost singlehandedly revived public awareness of microtonality in the 1990s. The AFMM has become a leader in new music activity today. Most recently, Dr. Auerbach and the AFMM performed a concert at the College of Staten Island as part of the Composers Now NYC-wide Festival. CSI students were introduced to the concept of microtonality. 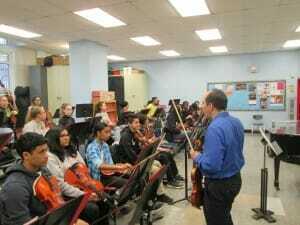 Together, Mr. Reinhard and Dr. Auerbach mentor Orchestra and Band students at Port Richmond High School. The band, under the direction of Frank Scarano, receives coaching on the subject of pitch and intonation within the realm of microtonality, Reinhard’s main area of expertise. Joe Curran’s Orchestra students coach with Dr. Auerbach on string intonation and explore various ways to adjust pitch, utilizing microtonality as a tool to further their knowledge of basic string tuning. Improving intonation is a major goal of both Orchestra and Band students as they prepare for their end-of-the semester concert at Port Richmond High School. This project is generously funded by an Arts Bring Change Grant from Staten Island Arts, with public funding from the New York State Council on the Arts. Dr. Auerbach is excited to have received this grant for the second time to be able to continue working with these dedicated students during the Spring semester. Dr. Dan Auerbach has recorded numerous CDs under the Pitch Label with AFMM, including Classic, Chamber, Idea, and Early. In addition, He has recently performed at Weill Recital Hall at Carnegie Hall with AFMM member, pianist Joshua Pierce. The Auerbach-Pierce Duo has recently released an album (The Devil’s Trill) for MSR Classics, cited as “scintillating performances throughout.” Reinhard has performed as a soloist throughout Europe and the United States, Japan, Canada, and Russia. He has played with such international virtuosi as kavalist Theodossii Spassov (Bulgaria), Thereminist Lydia Kavina (Russia), oboist Bram Kreeftmeijer (the Netherlands), and the FLUX Quartet (USA). For their last visit at Port Richmond, Reinhard and Dr. Auerbach will gather for a school assembly on Wednesday, May 1 at Port Richmond High School, Room B217 from noon to 1:00pm. They will perform for the students and lecture on the subject of microtonality and tuning. Stay “tuned” for more AFMM projects at Port Richmond High School.